Lovely Victorian Parlor Settee -- Beautiful settee, in original condition but with new upholstery, circa 1880. Walnut and burl with ebonized decoration, this lovely piece measures 64 inches long, 25 inches deep and 47 inches tall. Scroll down for order/inquiry form. 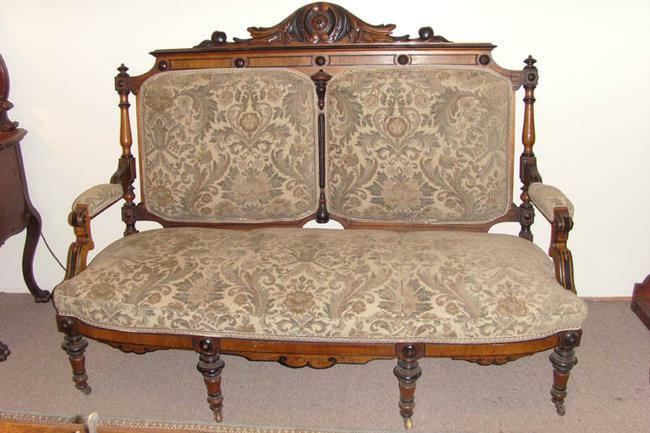 Beautiful settee, in original condition but with new upholstery, circa 1880. Walnut and burl with ebonized decoration, this lovely piece measures 64 inches long, 25 inches deep and 47 inches tall.